Begin your battle against of the conditions caused by long bouts of sitting. The OfficeGYM is new to the market and offers you no-sweat exercises that target over 25 different muscle groups. (check out the video below). 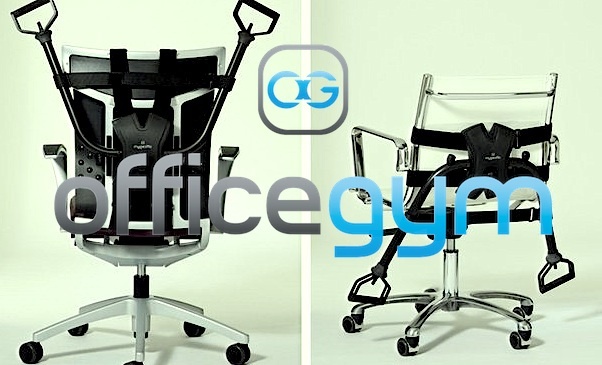 The OfficeGYM attaches to your own chair so you can keep your familiar and comfortable seat. This is good news especially if you have just invested in an expensive ergonomic office chair. Or even if you prefer the simple old style wooden seat! It is professionally crafted and designed. 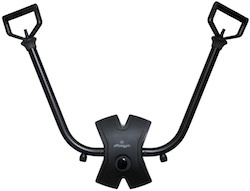 The originators of this took their OfficeGYM idea to a group of German Product Design Engineers. They made certain you would have a piece of office exercise equipment that would transform your chair into a tool you can use to burn calories, strengthen and tone right in your workplace. The engineers final design was then taken to Italy where the manufactures have detailed the final product into a functional, quality-made, low profile, attractive piece of equipment. Unlike some cheap products out there this one is what you expect of a German engineered and Italian made equipment. The ‘arms’ that can be in the up or down position to accommodate the desired exercise, made of aluminum, and the tubes are extruded specifically for this purpose. The main body is a patented composite of nylon and fibre glass and formed by using plastic injection moulding for solid structure. The resistance bands are top quality 100% rubber. There are three different weights that come with the original package for varied strengths. I can basically guarantee that everybody from beginner to seasoned athlete will ‘feel the burn’ with a well designed workout. 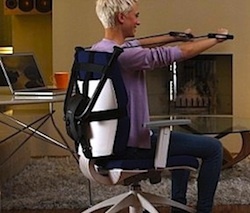 Having the OfficeGYM attached to your office chair converts it into a resistance exercise chair. How many times have you sat in your chair at work, just gotten off the phone with an aggravating customer or your boss and were feeling really tense and angry? Your heart rate is up, your breathing shallow, stiffness in your neck and shoulders and you feel stressed! Workplace stress causes us to pull up our shoulders which in turn can create back and neck pain. By just taking a couple of minutes to do one of the recommended exercises you can fight the tension head on. If you are looking for ways to fit fitness into your workday and fight the sedentary lifestyle of an office worker, this chair attachment has over 25 designer recommended exercises you can do that will help to alleviate all of that. * Although not specifically designed to replace a regular workout – I do know that many people don’t have scheduled workouts. 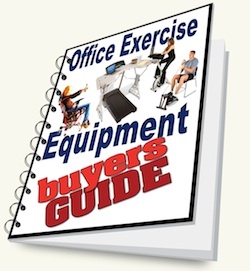 By having a couple pieces of exercise equipment in your office you will most likely be doing more exercise than you would without them. In my opinion the OfficeGYM can provide a great resistance workout, for either the novice or experienced athlete. I also believe that if you begin to incorporate even ‘some’ activity into your workday – you increase your desire for fitness and there is a good chance this daily activity alone might just prompt you to joining your local gym. Burn calories at work, fight fatigue, encourage weight loss, and improve your mood all with this wonderfully made piece of office exercise equipment. Target over 25 different muscle groups in your shoulders, neck, arms and back to improve your workday performance while building strength and toning. Exercises can be done standing or sitting. 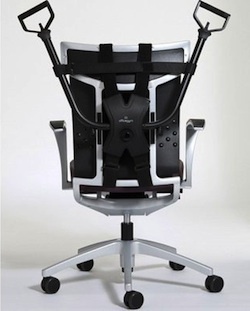 The OfficeGYM is a low-profile design and will attach securely to most any chair for your convenience. If you are seeking ways to add physical activity to your workday then this has been designed with you in mind. Very convenient and simple to attach to most any chair. If you aren’t sure just send me a picture of your chair and I will let you know. 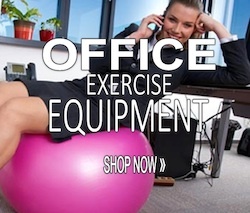 The purchase of the OfficeGYM is also 100% risk-free 30 day Guarantee. If for whatever reason you feel you need to return it – there will be no questions asked and your money will be promptly refunded regardless of what retailer you purchase from. Fits most any office chair, even a kitchen chair provided it has a back on it. Simple to assemble and attach. Sent UPS so I had the tracking number and it was shipped day after ordered. Shipped from US and got snagged at the CA border. This was fixed up with a quick phone call though. There are bands that can be used to hook to a chair like this. I think this might be a better fit for me.